Prior to Labour’s annual conference, the party navigated (and continues to navigate) the controversies surrounding accusations of antisemitism levied towards the leadership. Such comments led the headlines in many of the major news outlets, both in the UK and abroad. Yet there was little sense of that when I visited the conference. Instead the mood was one of anticipation and jubilation at the prospect of the party being returned to government shortly on a wave of popular discontent towards Theresa May and the Conservatives. This anticipation was predicated upon the assumption that May’s plan for Brexit would be voted down in the House of Commons, and that the defeat would trigger a general election. Needless to say there are constitutional reasons why this is by no means a straightforward road. Firstly, May would need to want a general election so close to Brexit – she’d need to call a vote for it in the House of Commons to make it happen and she’d need to win that vote against a Conservative Party that is hesitant towards a repeat of 2017. Should May be replaced as leader, then it is also likely that the new leader would want time to establish themselves before going to country as John Major did in 1990 and Gordon Brown in 2007. As such, the sense of jubilation felt at the Labour Party conference may be premature. However, in the climate in which we find ourselves, never say never. This does illustrate a concern that May must be feeling as the Conservative Party conference starts in Birmingham. Her recent negotiations in Brussels have not produced the results that she or her discontented MPs would have preferred. The Chequers deal is all but dead (yet she continues to back it) while those such as Jacob Rees-Mogg are snapping at her heels to push for a hard (no deal) Brexit. Such snapping has galvanised some elements of the grass roots, but has had little impact upon the strategy of the party leadership. May’s Downing Street statement prior to the conference sent out the signal that she intends to dig her heels in against the EU in order to produce a workable deal. This poses its own challenges, with the EU becoming increasingly discontented with the process and Brexit day looming ever closer on the horizon. But that signal was largely targeted at those within the Conservative Party who may be tempted to use the conference as a backdrop for their own ambitions for Brexit or the leadership. So, what does May need to do to reassure her party that she is the person to continue leading Britain into Brexit? Well, she needs to appear in control of the situation. This was the purpose of her Downing Street statement. It can be seen as a fundamental demonstration of leadership which, once lost, can be very difficult to retain. May’s conference speech needs to set out not just her vision for Brexit, but also a vision reflected by her supporters and, crucially, some opponents. For May, that means going beyond Chequers as the crucial final stages of negotiations with the EU begin. 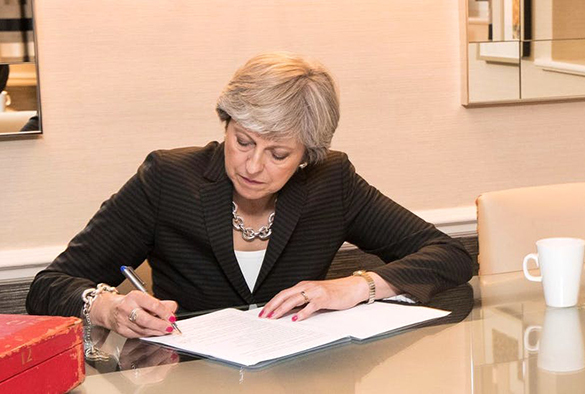 She must outline exactly what Brexit will look like and how it delivers on the key demands of Conservative backbenchers in a way that safeguards the economic and social interests of the country. Failure to do so risks exposing her leadership to accusations of indirection, at best, and incompetence, at worst. Indeed, should May fail to regain control over the party and her ability to command its confidence and respect, then she may well struggle to pass whatever deal she secures from the EU through parliament. In that eventuality, no deal becomes almost inevitable. Granted, the Labour Party may well see this as its moment to secure power, however if it is seen as complicit in those consequences (such as by voting down the May deal regardless of what it is) then it too will pay an electoral price. Consequently, as the Conservative conference opens, May and her cabinet will need to engage in an authoritative charm offensive. Their objective will be to navigate the conference in a secure and confident manner that shows they are in control and have a clear vision of what needs to be produced and how it will bring about Brexit in such a way that ends the debates over the UK’s relationship with the EU once and for all. The cost of failure will be very high for May, the Conservative Party, and the country.